Adobe CS Live (New!) is an online service that allows you to set up or manage (sign in and out) an Adobe account, access Adobe Browserlab from a panel, learn about reviewing CS5 documents online, view netaverages from SiteCatalyst, access the Acrobat.com subscription-based Web site or the Adobe ConnectNow Web site where you can collaborate with others, display CS news and resources in a panel, and access an Adobe Web site with information about CS Live Services. You can access these options directly from the CS Live menu on the right side of the menu bar next to the Search bar. When the CS Live menu icon includes a bulls eye, you are signed in to the online services. 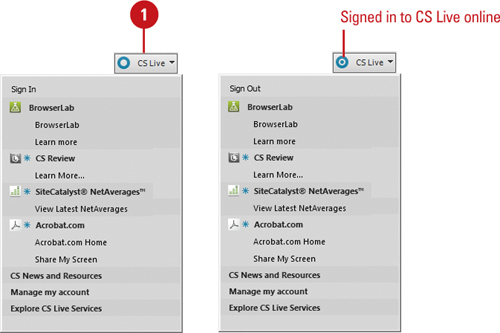 Set Up Your Access To Adobe CS Live Online Services, Sign In, or Sign Out. Select to set up, sign in, or sign out of the CS Live online service. BrowserLab. Accesses an online tool from a panel to view how different operating systems and browsers render Web pages. CS Review. Learn how to review CS5 documents online. SiteCatalyst NetAverages. View the latest NetAverages using SiteCatalyst from Omniture. Acrobat.com Home. Opens the Acrobat.com subscription-based Web site that allows you to work and collaborate with others. Share My Screen. Opens the Adobe ConnectNow Web site where you can collaborate on design projects online. CS News and Resources. Opens the CS News and Resources panel with news and resources. Manage My Account. Opens a secure Web site to manage your Adobe account information. Explore CS Live Services. Opens an Adobe Web site that describes CS Live Services. 1. 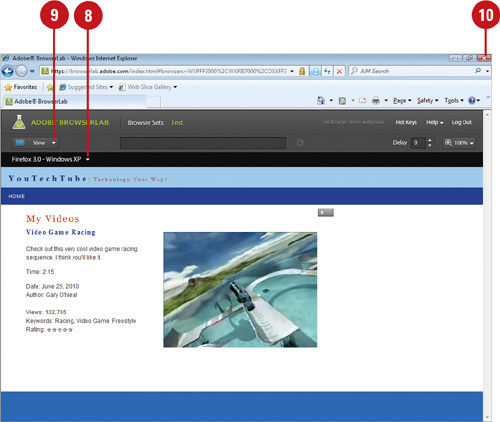 Open the Web page you want to view in a Design view or Live View. 2. To find out more about BrowserLab online, click the CS Live menu, and then click Learn More (under BrowserLab). 3. 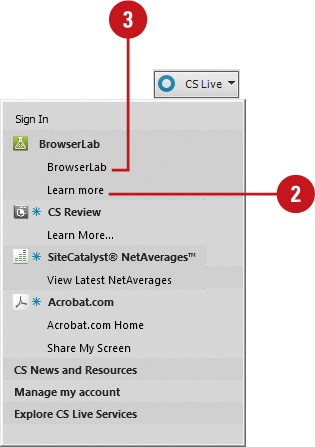 Click the CS Live menu, and then click BrowserLab. 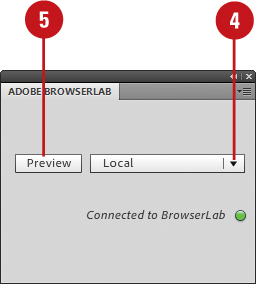 You can also click the Window menu, point to Extensions, and then click Adobe BrowserLab. 4. Click the Location list arrow, and then click Local or Server. You can also click the File menu, point to Preview In Browser, and then click Adobe BrowserLab. 6. If prompted, click Yes to update the file on the server. Your browser opens, displaying the Adobe BrowserLab Web site. 7. If prompted, enter your Adobe ID and password. 8. Click the Browser list arrow, and then select the browser you want to use. 9. To view the page using multiple browsers, click the View list arrow, and then click 1-up View, 2-up View, or Onion Skin. Check the page display and links. 10. When you’re done, close your browser.